5 historic theatres would be destroyed, and many more compromised. Inigo Jones’s 17th century Piazza colonnades had been replaced with larger versions in the 18th and 19th century. These would in turn be replaced – by concrete. 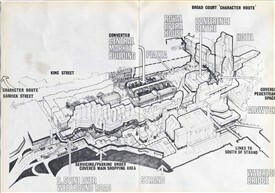 A new office and walkway complex would dominate the south side, with a conference centre and high-rise tourist hotel on the east side, and an extended Royal Opera House along much of the north side. The central market halls would be rehabilitated with shops and restaurants, but under a plastic roof to replace the 19th century one that was said to be rotten. The elegant glass and ironwork floral halls, and the Jubilee market hall would all be demolished. Cambridge Circus would be flattened to create a ‘major new landmark’ with a huge sports centre, an ‘elevated public transport corridor’, and residential units on the upper floors. 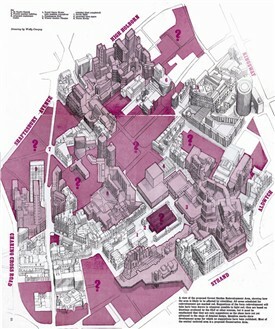 Most of Seven Dials across to Holborn would be rebuilt in concrete too, for offices and new housing blocks. A 4 acre park would eliminate half the buildings from King Street up to Shelton Street, destroying the Woodyard Brewery and half of Long Acre. More than 7,500 parking spaces would be created in the area; yet the local population then owned fewer than 300 cars! 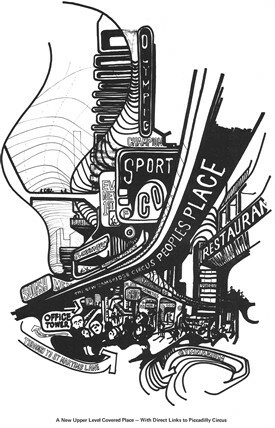 As land prices rose in anticipation of a property killing, the cheap shops and eateries that served the Cockney population started to give way to more fashionable and expensive venues for visitors and business workers. Locals were conscious that they were already being priced-out in the 1960s. 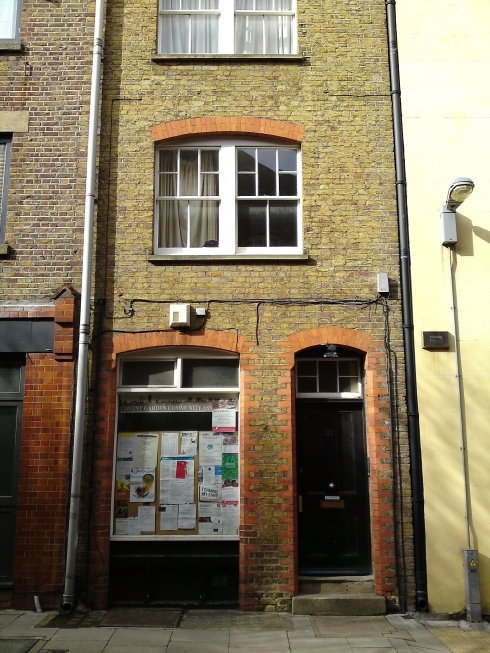 In 1960 there had been 13 greengrocers in Neal Street; by 1972 there were only 4. Domestic rented property lay unrepaired as landlords waited. Leases were not renewed and tenants had to leave. The resident population fell to an estimated 3,300 by 1968, with another 1,000 living in hostels for single men. The plan hoped that new high-rise housing would lift the population to 7,000 people. For the majority of locals who were living in substandard housing conditions, this would mean moving away when their homes were demolished to make way for new flats at higher rents which many of them could not afford. Rather than protecting the local community, it seemed that the authorities were encouraging market forces to act in a way that would destroy it.